Copyright: © 2017 Onkar A, et al. This is an open-access article distributed under the terms of the Creative Commons Attribution License, which permits unrestricted use, distribution, and reproduction in any medium, provided the original author and source are credited. Purpose: To bring in perspective a rare case of spindle-cell sarcoma of lid with intra-orbital metastasis. Methods: A seventy-five year old female presented with complaints of severe pain in right eye and right sided headache for 2 months along-with constant watering. She had a history of cataract surgery with IOL implantation in bag in right eye 4 months back. During the same time, a mass lesion was also removed from underside of right lower lid which was present for about 7-8 years. She was asthenic in built and was found to have pallor. On ophthalmic examination she was found to have Snellen’s visual acuity of 6/60 OD, 6/18 OS. Intra-ocular pressure was 37.5 mm of Hg OD, 18.6 mm of Hg OS. Ocular movements were restricted in lateral and superior gaze in right eye. On palpation stony hard, tender induration could be appreciated along the right infero-nasal lid margin. Fundus examination revealed chorio-retinal folds in inferior quadrant peripherally. No palpable lymph nodes were observed. CT scan brain and orbit was advised along-with routine blood investigations and IOP control medications. Results: CT scan revealed a heterogeneous cystic lesion measuring 17 × 16 × 21 mm in antero-inferior right orbit, abutting the globe and inferior rectus with thickening of uveo-scleral ring. The right globe was compressed and displaced supero-laterally. No bony erosion or infiltration of orbital fat or optic nerve was seen. Earlier histo-pathological report of excised lid tumor revealed low grade spindle cell sarcoma. Conclusion: Spindle cell sarcoma of lid is rare entity. This case report reveals a spindle cell sarcoma of lid with intraorbital metastasis. A seventy-five year old female, resident of Mandor village, Jodhpur, presented with complaints of severe pain in right eye and right sided headache for 2 months. She had a history of cataract surgery with IOL implantation in bag in right eye 4 months back in a rural camp setting. During the same time, a mass lesion was also removed from underside of right lower lid which was present for about 7-8 years and was sent for histopathological examination. It was reported to be a low-grade spindle cell sarcoma. The tumor was mentioned to be devoid of any surgically free margins except for lateral margins and there was lack of circumscription of tumor mass. The patient was referred to AIIMS, Jodhpur. She deferred the visit initially citing the gain in vision in right eye following cataract surgery to be very gratifying. But, when the pain in right eye became unbearable she presented with the afore-said complaints. On general examination, she was asthenic in built and was found to have pallor. No palpable lymph nodes were observed and there was no icterus, clubbing, cyanosis. There was no history of diabetes, hypertension, tuberculosis or addiction or any radiation therapy. There was no history of any ocular trauma apart from the surgical trauma sustained during removal of lid tumor and cataract extraction 4 months back. There was no history of any other tumor except for the lid tumor already mentioned. On ophthalmic examination she was found to have vertical dystopia, with the right eye displaced superiorly and laterally. The left eye had an esotropia of 30 prism dioptres. There was swelling of both lids with engorgement of veins on upper lid OD. Snellen’s visual acuity was 6/60 OD, 6/18 OS. Intra-ocular pressure was 37.5 mm of Hg OD, 18.6 mm of Hg OS. Ocular movements were restricted in all gazes in right eye, more in lateral and superior gaze (Figure 1). On palpation, stony hard, tender induration could be appreciated along the right inferonasal lid margin. Anterior segment examination revealed congestion of episcleral vessels (Figure 2). Peripheral corneal thinning and opacity adjoining the limbus from 4 to 6 o’ clock was present OD. This corresponded to previously resected lower lid mass (Figure 3). 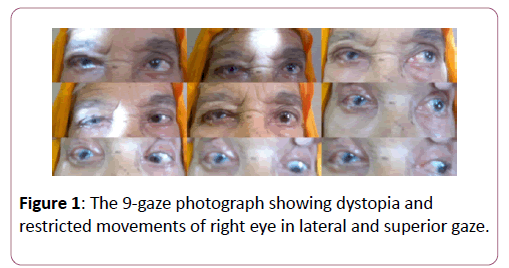 Figure 1: The 9-gaze photograph showing dystopia and restricted movements of right eye in lateral and superior gaze. 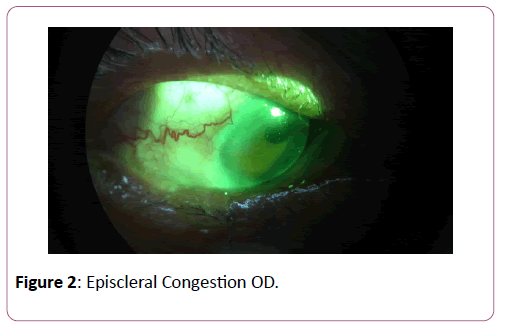 Figure 2: Episcleral Congestion OD. 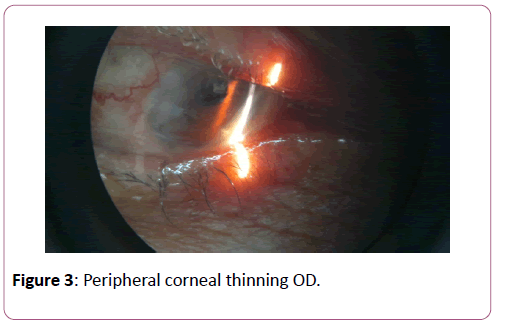 Figure 3: Peripheral corneal thinning OD. Pupils were normal sized OU and slightly sluggish reacting OD. No cells, flare, keratic precipitates, hypopyon or hyphaema was seen OU. Patient was pseudophakic OU. Anterior segment OS revealed pinguecula nasally with thick arcus and pseudophakia (Figure 4). Gonioscopy showed grade II-III angles in all quadrants OU, with heavily pigmented TM OD. Fundus examination revealed normal sized, shaped discs with mild temporally pallor and temporal crescent OU. Fundus had a tessellated appearance with appreciable foveolar reflex OU. Vessels were tortuous and engorged OD. Chorio-retinal folds were present in inferior quadrant peripherally OD. On reviewing her past medical records, she was found to have low-grade spindle cell sarcoma of the lower lid nasally. Two months back, just before undergoing her cataract extraction in right eye, her lower lid mass was excised and sent for histopathological examination which confirmed the diagnosis (Figure 5). Patient was started on IV Mannitol 20%, 1mg/kg stat with monitoring of the vitals. The IOP measured after an hour was found to be 28.6 mm of Hg OD. Patient was put on E/D Brimonidine 0.1% and tablet acetazolamide 250 mg tds with potassium supplements. CT scan brain and orbit was advised along-with chest X-ray PA view and routine blood investigations. Figure 5: Spindle-cell configuration on HPE with eosinophilic cytoplasm, elongated nuclei, mitotic figure with minimum pleopmorphism. CT scan revealed a heterogenous cystic lesion measuring 17 × 16 × 21mm in antero-inferior right orbit, abutting the globe and inferior rectus with thickening of uveo-scleral ring. The right globe was compressed and displaced supero-laterally. No bony erosion or infiltration of orbital fat or optic nerve was seen (Figures 6 and 7). Chest X-ray was reported to be normal and blood investigations revealed a normocytic, normochromic anaemia. Lid sarcoma and sebaceous gland carcinoma were considered as the chief pathologies among the differential diagnosis. 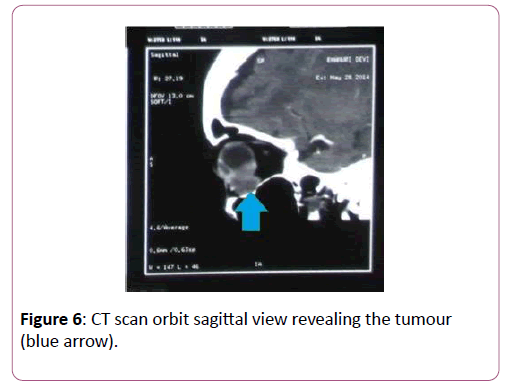 Figure 6: CT scan orbit sagittal view revealing the tumour (blue arrow). 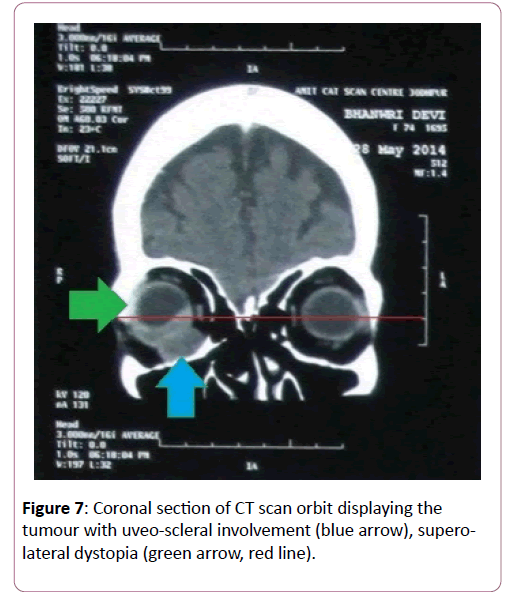 Figure 7: Coronal section of CT scan orbit displaying the tumour with uveo-scleral involvement (blue arrow), superolateral dystopia (green arrow, red line). 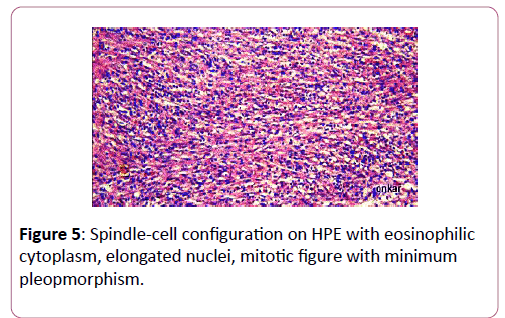 Histo-pathological report of excised lid tumor revealed low grade spindle cell sarcoma. Haematoxylin and Eosin (H&E) staining was done. The features suggestive of spindle-cell morphology were solid, fascicular to somewhat irregularly intertwining, cellular tumor of spindled cells. There was lack of circumscription of tumor mass, relatively monomorphic cellular appearance, nuclear hyperchromasis, irregular nuclear membrane, one or two prominent pink nucleoli, oval to blunt elliptical shaped nuclei, moderate mitotic activity with few atypical mitotic figures and conspicuously eosinophilic cytoplasm. These features are seen throughout the tumor area. Sections also show atypical spindle cells are forming different types of patterns like intersecting fascicles, storiform pattern, nuclear palisading along with alternate light and dark areas of tumor cells arrangement. Hyalinized thick blood vessels at the upper margin of tumor mass are seen along with chronic inflammatory cells infiltrations and many small blood vessels and vascular spaces in between the tumor cells are seen. Surface epithelium and upper dermis seems to be uninvolved with tumor process. Considering the involvement of uveo-scleral ring, enucleation of right orbit was planned after proper informed consent from the patient. Sarcomas account for less than 1% of all adult solid malignancies, with spindle-cell variety accounting for only 5% of these [1-3]. Eyelid is a very uncommon location for soft-tissue sarcomas. Way back in 1893, Gruening reported the first case of spindle-cell sarcoma of eyelid . Wilmer, in his study of lid sarcomas, reported 40% of the lid sarcomas to be of spindle-cell variety . The present case is a rare case of spindle-cell eyelid sarcoma with intra-orbital metastasis. It was reported to be a low-grade spindle cell sarcoma. Since the initial resected tumor was mentioned to be devoid of any surgically free margins except for lateral margins and lack of circumscription of tumor mass, it was highly likely that the tumor extended into the antero-inferior orbit leading to the dystopia and headache. In this case though the patient was appropriately referred, the patient delayed as she was satisfied with the gain of vision in her right eye after cataract extraction with IOL implantation. This case also highlights the need for urgent referrals of such cases with prognosis explained to the patients/relatives. To conclude, Spindle cell sarcoma of eyelid is rare entity but with dreaded outcomes. This case report reveals a spindle cell sarcoma of eyelid with intra-orbital metastasis. Zahm SH, Fraumeni JF Jr (1997) The epidemiology of soft tissue sarcoma. Semin Oncol 24: 504-514. Burningham Z, Hashibe M, Spector L, Schiffman JD (2012) The epidemiology of sarcoma. Clin Sarcoma Res 2: 14. Clark MA, Fisher C, Judson I, Thomas JM (2005) Soft-tissue sarcomas in adults. N Engl J Med 353: 701-711. Gruening E (1893) A Case of Spindle-celled Sarcoma of the Lid. Trans Am Ophthalmol Soc 6: 504.2-510. Wilmer WH (1897) A case of melanotic, giant-celled, alveolar, myxo-sarcoma of the eyelid. Transactions of the American Ophthalmological Society 7: 91-95.